This path was clearly dug by someone but then partially covered over by fresh snow. As I was walking to the bank this morning, trekking through the snow, I noticed that sometimes there was a solid path, sometimes slush and sometimes snow. Why in some segments of the sidewalk the sidewalk is totally clear, you can see the actual pavement, while in other segments it is partially dug out while in others it is totally covered by snow and all you can see are the footsteps of other pedestrians trying to make their way through the snow. Why did the city clear some segments of the side walk but not others? Suddenly the answer came to me, and it was profound. Paths in the snow, some solid, some less so. It was not the city that was clearing the sidewalks. 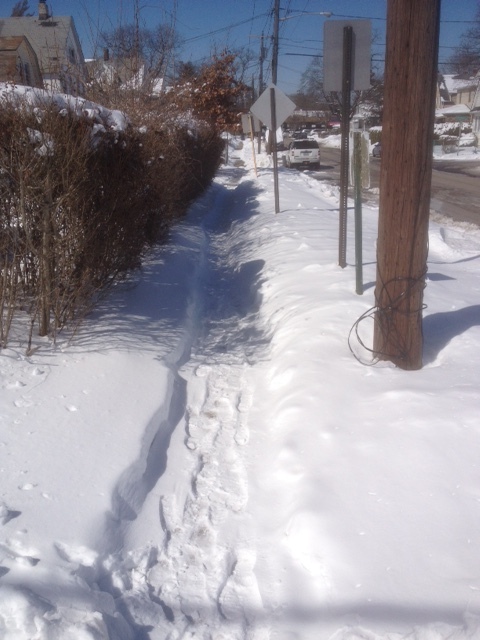 It was not the job or the responsibility of the city to clear the sidewalks. The city was responsible for clearing the streets, and that they did rather well. The sidewalks fell within the responsibility of the individual owners, the houses that bordered on those sidewalks. It was up to them to clear the sidewalks, or not. To shovel, put sand or salt, or not. Some chose to do so and some chose not to. To those who chose to clear the path I say Thank You! As I walk by your house I thank you for making my journey a little easier and a little more pleasant. And for those who could not be bothered I have to wonder about your sense of communal responsibility. Do you care about your fellow man? If you had to walk wouldn't you appreciate a clear path? 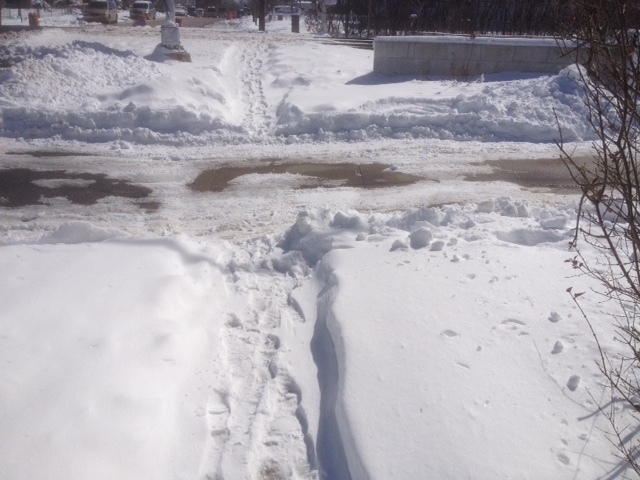 If each person took the time to clear the sidewalk in their territory travel would be much easier for all. As it stands now the journey is bumpy and unpredictable and at times even dangerous. A slippery sidewalk can lead to an accident. 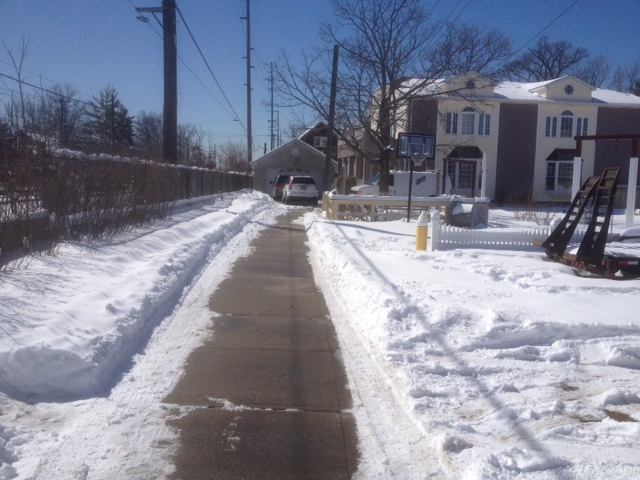 A snow covered sidewalk can lead one to walk on the street and have to contend with cars and trucks. The journey is the product of the community effort. The same is true of Krav Maga, only a little less obvious. Clearing the sidewalk clearly benefits those who live in that house. But it also benefits the community. Same for Krav Maga. We train in Krav Maga to protect ourselves and our loved ones but the effect is also felt on the entire community. Imagine a community where everyone was a black belt in Krav Maga. Imagine that word went out...Don't mess with Mitzpe Nevo, everyone there is a trained Krav Maga expert. Perhaps the criminals would think twice. And if everyone was indeed trained. What would happen if someone tried to abduct a child or harm a woman? Everyone would come out, no fear, ready to attack and defend. Krav Maga, and clearing the snow, is everyone's responsibility. You owe it to yourself, your family and your community.